Hawaii. Peter Vroom . © Peter Vroom (Peter.Vroom@noaa.gov). Published in: Verbruggen, H., De Clerck, O., N'Yeurt, A.D.R., Spalding, H. & Vroom, P. (2006). Phylogeny and taxonomy of Halimeda incrassata, including descriptions of H. kanaloana and H. heteromorpha spp. nov. (Bryopsidales, Chlorophyta). European Journal of Phycology 41(3): 337-362. Halimeda kanaloana Vroom differs from related species through the combination of a large bulbous holdfast anchoring the specimen in sand, a basal thallus region of massive cylindrical to slightly flattened segments, large obovoid to cuneate trilobed segments in the central and distal thallus regions (median length 9-14 mm, width 6-11 mm, thickness 1.5-2.9 mm), medullar siphons fusing into a single unit at segment nodes, obvious pores connecting neighbouring siphons at segment nodes (median pore height including cell walls 47-69 µm), 4-5 utricle layers, large peripheral utricles (median diameter 56-73 µm, height 69-98 µm) that reach 42% of their maximal width at a quarter of their height and do not have rounded corners in surface view, and markedly inflated subperipheral utricles. Type locality: Keyhole, Mau'i, Hawai'i, USA Holotype: P.S. Vroom; 6 September 2004; growing in a monospecific meadow at a depth of 56 m. BISH 715565 Notes: PARATYPES: H.0649 through H.0658 (GENT), Honolua Bay, Mau'i, Hawai'i, USA. HS-2004-162, HS-2004-171, HS-2004-173 through HS-2004-178 from Keyhole, Mau'i, Hawai'i, USA. HS-2004- 157, HS-2004-159, HS-2004-161 from Kaho'olawe, Hawai'i, USA. Verbruggen, H., De Clerck, O., N'Yeurt, A.D.R., Spalding, H. & Vroom, P. (2006). Phylogeny and taxonomy of Halimeda incrassata, including descriptions of H. kanaloana and H. heteromorpha spp. 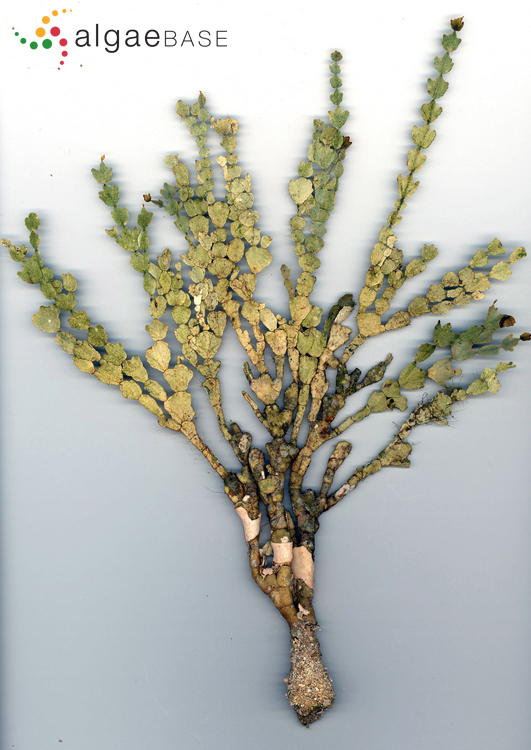 nov. (Bryopsidales, Chlorophyta). European Journal of Phycology 41(3): 337-362.